Yet another entrant in the ever-growing stable of crossovers, the 2008 Ford Edge makes a solid statement for the Big 3’s elder statesman. With typical Ford low-end torque, the Edge gets off the line quickly, which comes in handy when trying to maneuver through city traffic or merge onto congested highways. Its overall styling – both inside and out – is understated and clean, and the factory sound system brings the noise. Headroom and cargo space leave a little to be desired, but competitive pricing makes it a good choice for the family looking for good power and great looks, all with a reasonable price tag. The interior design and orientation make it a better people mover than a moving van. The rounded edges and clean, well-developed look of the Edge get it noticed in a crowded segment. The dashboard is simple and easy-to-read, if a little uninspired. With its heavy low-end torque, the Edge does well in stop-and-go city traffic. The optional voice-controlled SYNC package is a must-have for managing phone communications and audio programming. Our primary complaint is the lack of headroom in the front seats, which creates the perception of a smaller car. Gear shifting transitions at lower speeds are a little lazy, which contribute to a jumpy ride as the car picks up speed. Standard brakes are also a little less responsive than others in its class. The overall ride is smooth and consistent, especially as it gains speed. It has a lot of power, which is mostly apparent when accelerating from a stop. At high speeds, the Edge handles easily but is a little noisy. At lower speeds, especially in traffic, the Edge feels a little stiff, more reminiscent of the Explorer than a crossover designed to drive like a car. Also, the automatic transmission is a little choppy as the car shifts into gear at low speeds. Overall, however, a positive driving experience, and when coupled with its power, the Edge is a fun drive for the money. 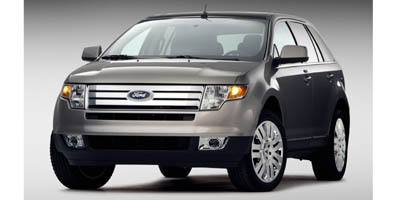 The 2008 Ford Edge has a 3.5-liter V-6 engine that produces 265 horsepower and 250 ft-lbs. of torque and is mated to a six-speed automatic gearbox. The Edge comes with either an all- or front-wheel drive configuration. A key optional feature is the dual-panel Panoramic Vista Roof - a 27.3â€ by 29.4â€ forward panel that tilts and slides open, and a fixed 15.75â€ rear panel - that affords gorgeous views of the sky you wouldn’t normally get with a standard sized moonroof. The Ford Edge SEL and Edge Limited allow you to purchase voice-activated navigation or a rear-entertainment DVD system, better to keep the kids quite on long drives. Also, new for 2008, is an optional power rear liftgate on some up line trim levels. The Edge features an auxiliary MP3 audio input and a single CD player. There is also the option of adding SYNC, a voice-activated communication program that allows you to control your music and phone calls via Bluetooth simply by saying a command. The ULEV-II-rated Ford Edge gets 16 mpg city and 24 mpg highway with front-wheel drive and 15 city and 22 highway with the optional all-wheel drive, on par with the other vehicles in the its class. This Edge seats five comfortably and comes with standard cloth covered seats with leather as a welcomed option. Standard side and curtain airbags cover most of the interior, providing a welcoming sense of safety. The Edge features rear reclining seats with 40/60 fold down capabilities. There are also rear ventilation ducts for added comfort. The 2008 Ford Edge sports a large chrome grille and rear spoiler to give it a brawny feel. In what looks like an homage to its class competitor, the Nissan Murano, and platform-mate, the Mazda CX-7, the Ford crossover borrows some of its exterior design elements. That said, the curvaceous, yet masculine lines on the Ford come across as sleeker and more attractive, than those other cross-utes. The Edge starts at $25,565 for the SE and works upwards to $27,560 for the SEL and tops out at $30,555 for the Limited. These prices are in line with its segment competitors like the Saturn VUE, Honda Pilot, Mazda CX-7 and the Toyota Highlander. A good choice for the family on the go as there is no need to sacrifice American power for a safe and smooth ride, especially once the ‘Ute gains some top-end steam. 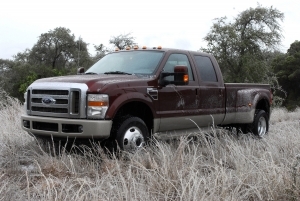 The Edge is nicely appointed for its class, is fun to drive and comes across as a solid symbol of Ford’s new resurgence. Well worth a look.